Many people know the deeds of Ravana, the captor of Sita in the Indian Epic the Ramayana; however, less well known are the incredible accomplishments of his father-in-law, King Maya. According to legend, the Hindu Sun god, Surya, revealed to Maya highly specific knowledge of the cosmos, presumably to allow the people of Earth to better worship him. This series of treatises is known as the Surya Siddhanta and it is the oldest book of astronomy known to exist. It is startlingly accurate. 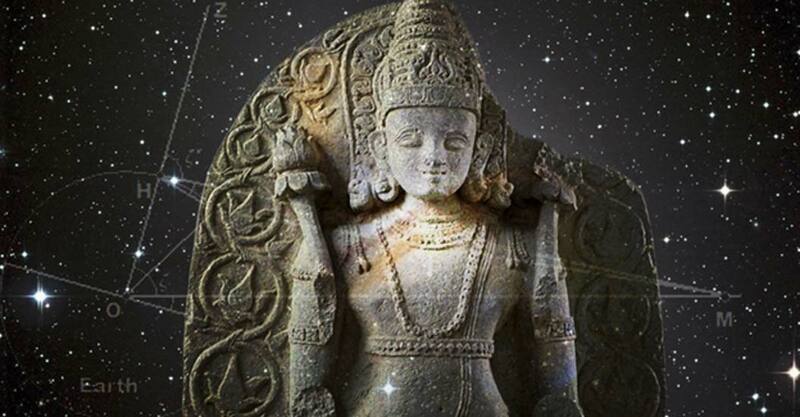 The Surya Siddhanta is an incredible testament to the advanced thinking of ancient Indians. In this text, one can find the roots of trigonometry as well as essential mathematical inventions such as standard notation and the decimal system. In addition, the text describes gravity over a millennium before Sir Isaac Newton developed his theory in 1687. It explains sidereal revolutions and how planets move eastward. It accurately calculates the size and position of distant planets, the length of a tropical year, and the amount of time that has passed since creation. Finally, in its discussion of how time passes at different rates under different circumstances, it contains the seeds for relativity. Hindu lore has it that the Surya Siddhanta is 2 million years old. Vedic tradition holds that, in an oral form, it was first composed 2500 years ago. Modern scholars think that it was most likely composed sometime during the early 6th century AD. Holding aside the possibility of divine inspiration, many believe that the wisdom found in the Surya Siddhanta came from a confluence of Indian and Greek thought, which came together during the Hellenistic Age. In particular, the work of Hipparchus seems to have had a significant impact on Indian thought. Hipparchus is widely believed to have been the first mathematician to create (or at least possess) a trigonometric table. His table contained a list of all the values for the chord function, that is, the length of a piece of chord for each angle of a circle. Trigonometric tables are essential for astrological calculations as well as navigation and engineering. Hipparchus used his table to tabulate the orbits of the Sun and Moon. The work of Hipparchus would have been lost forever had it not been preserved by his contemporaries in India. Objects fall on earth due to a force of attraction by the earth. Therefore, the earth, the planets, constellations, the moon, and the sun are held in orbit due to this attraction. The average length of the tropical year as 365.2421756 days, which is only 1.4 seconds shorter than the modern value of 365.2421904 days. The average length of the sidereal year [the actual length of the Earth’s revolution around the Sun] as 365.2563627 days, which is virtually the same as the modern value of 365.25636305 days. The estimate for the diameter of Mercury is 3,008 miles, an error of less than 1% from the currently accepted diameter of 3,032 miles. The estimate for the diameter of Saturn is 73,882 miles, which has an error of less than 1% from the currently accepted diameter of 74,580. The Surya Siddhanta plays an important role in the history of modern civilization. By preserving and expanding upon the wisdom of the Ancient Greeks, the ancient Indians prepared the way for the development of Islamic mathematics and astronomy. Indeed, the Surya Siddhanta was one of the few Sanskrit texts translated into Arabic by Abbasid Khalifa al-Mansur, the founder of the Abbasid Caliphate. This knowledge, advanced and transmitted across cultures and centuries, ultimately survived into the modern era and found its way back to the West. Hate to break it, but Indian / Hindu civilization were the ones EVERYBODY else borrowed from, not the other way around.